Everyone loves puppies. Everyone loves sleep. 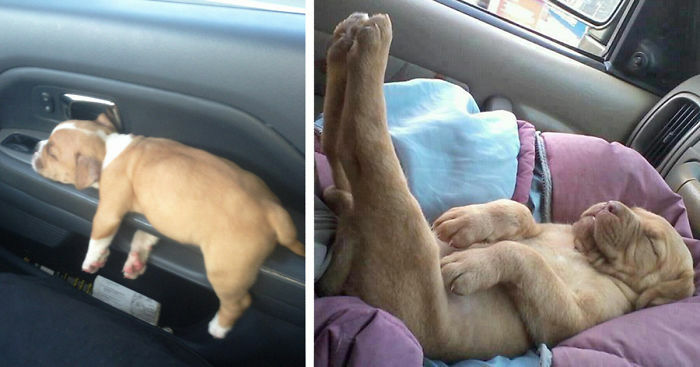 What, then, could you dislike about these 30 pictures of puppies sleeping? Putting aside the Cuteness Overload, puppies, like human babies, need plenty of rest for their development. Like a human teenager, they can also sleep for up to 18 hours a day. Nobody will steel my food! I like mine over easy. I was a soldier in my past life. Getting a little yoga in. Awww! All those jelly rolls!!! That was quite funny to see those dogs sleep in some impossible poses. ohhh he looks like a little polar bear! Some one had a rough night! Lady and the enormous dog! No thief can break in! This is sad. Puppies are like babies, should not be in a scene like this. Behold the new generation of book holders! They come in different sizes and colors too! he probably knocked out after smelling it!! Reminders of life beyond this. My cat does that too! #68 I Don't Care What You Think - It Is Comfortable! #71 A Spaniel Pillow...how Comfy! #80 Voodoo Loves To Sleep! #82 Brio And Poco And Daddy Slept Long Enough For Me To Paint Their Portraits. #85 Life Is Just Soooo Exhausting! #86 Hallie Can't Even Right Now. ... and trying to keep the light out of his eyes.